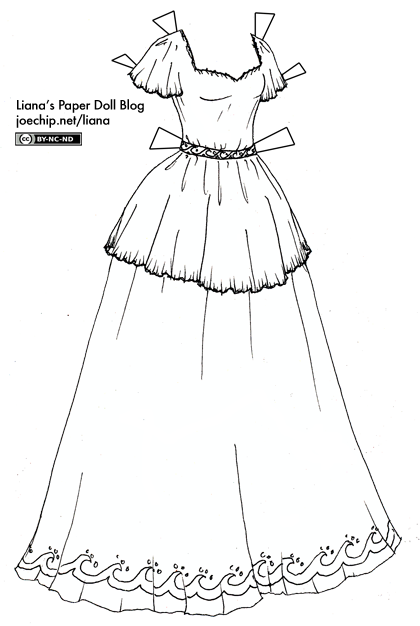 I wanted to draw a princess-ish dress today, but it’s too hot and even drawing loads of fabric seems unappealing. (OK, so even with short sleeves, even if you imagine the fabric to be fairly light this is still quite a lot of imaginary fabric, but Ivy doesn’t have the same concerns in her life that I do, so it’s all right.) This one seems a little boring to me, but colored (maybe in light, cool colors) with a little pattern here and there, I bet it’d be really cute. Brian and I saw The Secret of Kells today, a fantastic animated movie about The Book of Kells. The art style is absolutely gorgeous and intricate, and the story was charming as well. The waves here are kind of influenced by it, come to think of it, although I didn’t really realize until Brian pointed it out! Time for a new contest! Winner gets to pick any one of my black-and-white dresses and tell me how they want it to be colored. The last one got a mite tedious, so this one will run from now until 9:00 PM EST, June 2nd. Edit: It’s Sunday, and I’m not posting a paperdoll today but I am posting a hint! It’s between 10,000 and 30,000. I must’ve checked your site 12 times today waiting for you to post XD I’ve wanted to color all day lol. I don’t’ like being busy, I miss too much. I really liked the last three days though and this dress is wonderful I’ll have to really try to get my printer in order so I can color it and get it up. Believe it or not, I’ve seen a facsimile of the book of Kells, had to do research on it for a display at work, and I have to agree with you. The artwork was breathtaking! Maybe I’ll go look up some of the pages for when I color this one. I’d never heard of that movie so I went to the site, the music is very beautiful, almost haunting. I’m going to take a guess that you got 785 visits. I visit your site frequently and love to print them out and dress the paper doll. Ah but woe is me because I have no colour printer sadness…. Oh well at least I can still enjoy your gorgeous dresses! I love that each dress is so detailed and yet each is completely unique. I hope that these comments don’t appear to be flagrant and empty flattery. I truly love your drawings. um… 18,000? I know… maybe too much… maybe too little… oh wellz :) but I bet you had more. My guess… lots and lots! Thats probably correct, but, uh… 2,347? This is cute. Lol, that’s funny about not even wanting to draw a dress with lots of layers. I’m going to guess about 15,000. Nice dress too. Yay Yay Yay Yay! Something new for me to color! I guess 25,273! hey the book copy of the book of kells is owned by my library in centerville OH. I agree, the letters are really cool. I’m going to say 508. I like it, it’s cute. I’m going to guess 28,579. : ) I don’t know why but I figure that there are a lot of people having a look. And I love your designs. They are fabulous!